You have the opportunity to go to one of those photo “hotspots,” a place you’ve always dreamed of shooting. You’ve seen some photos, heard about some locations, but you’ve never been there. Like most photo trips, your time is limited and you want to maximize it, getting to the best spots at the best times. The trouble is, you have limited knowledge of the place. How can you plan ahead, identify locations, and have directions to efficiently get you from place to place? 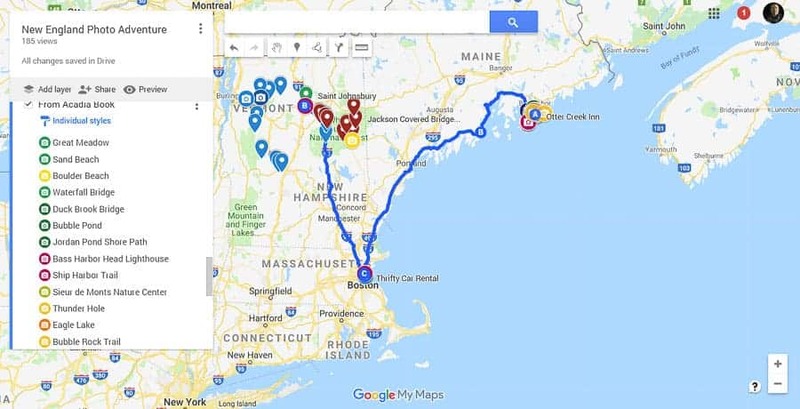 That’s the scenario for a trip my photo buddy, Dan Mottaz and I will be taking as we are planning a trip to New England and Acadia National Park. Coming from the Boise, Idaho area, we have almost no familiarity with that part of the country. Fortunately, I’ve had lots of time to research and learn some tools that can help us. So, in this article, I will talk about a “Plan, Plot, Drive, and Shoot” approach we’ll be employing. I first need to alert the reader I am a PC computer user and an Android phone and tablet owner. I have no Apple devices nor am I very familiar with that system. I do believe however that most of the tools and techniques I will discuss here will work on IOS systems or equivalents exist. Adjust as needed. Stealing a phrase from the real estate crowd, making good landscape photos often is about getting to that great location. So how can you identify and map those spots so you can easily navigate to them? Locations can be referred to in many ways. One is the simple place name – i.e. Acadia National Park. Of course, when seeking a photo spot, we probably want to be more specific, something like Bass Harbor Lighthouse. In the past, we could have found it with a paper map, written directions, and perhaps some coaching from the locals. These days we use GPS coordinates. The Global Positioning System is a space-based navigation system that provides location and time information in all weather conditions, anywhere on or near the Earth where there is an unobstructed line of sight to four or more GPS satellites. GPS uses the longitude and latitude of places to identify them. 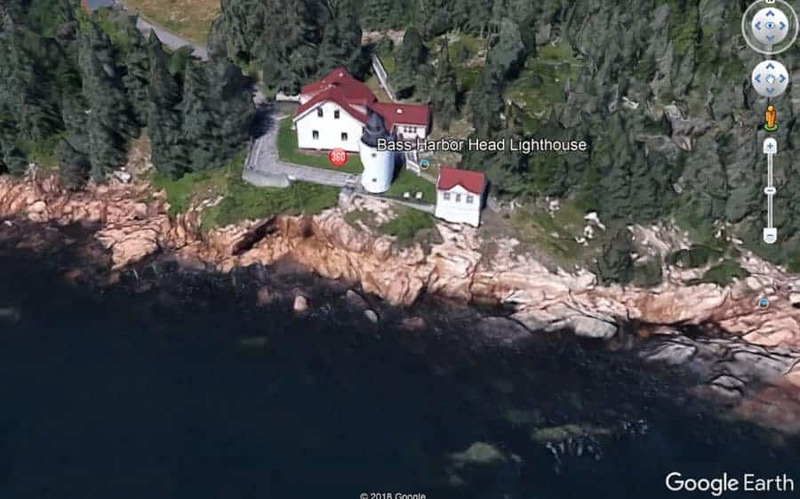 So, the Bass Harbor Lighthouse is at 44°13'19.27″N, 68°20'14.79″W. The first set of numbers is how far North of the equator the spot is, the second set how far West of the Prime Meridian. 33°51'23.68″S, 151°12'53.49″E – That's the GPS location of the Sydney Opera House which is South of the Equator and East of the Prime Meridian. 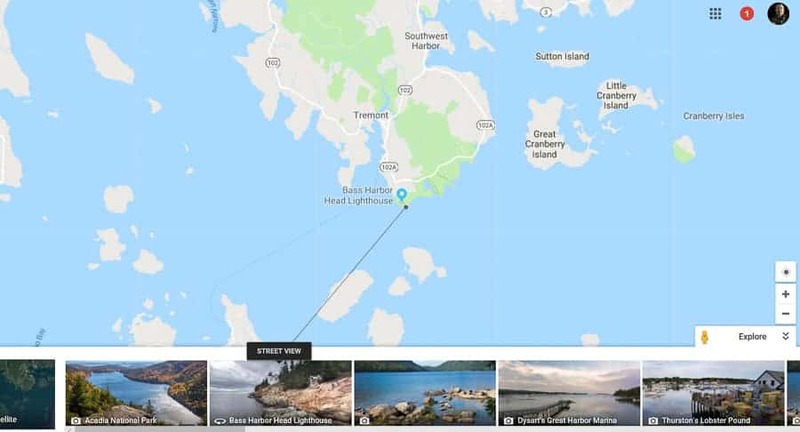 44°13'19.27″N, 68°20'14.79″W – The GPS coordinates of the Bass Harbor Lighthouse which is North of the Equator and West of the Prime Meridian. Places South of the Equator and East of the Prime Meridian would have GPS coordinates that look like this for the Sydney Opera House in Australia – 33°51'23.68″S, 151°12'53.49″E. What’s great is that any place on the Earth can be identified with GPS coordinates and so many of the devices we use for mapping these days use them. If you copy and paste the above coordinates into your web browser and search for them, you will get a map of those precise spots. 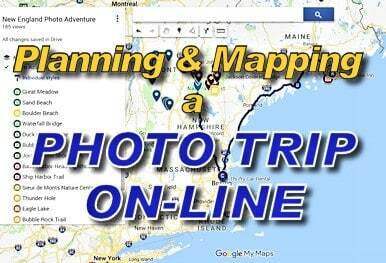 With that background information, let’s talk about some ways you can identify good photo spots and then get the coordinates for those spots to use in a mapping program or device. Chances are good if you tell someone you’re going to a place and they have some familiarity with it, (particularly if they are fellow photographers), they will tell you about good photo spots. “Oh, you’re going to Acadia National Park? 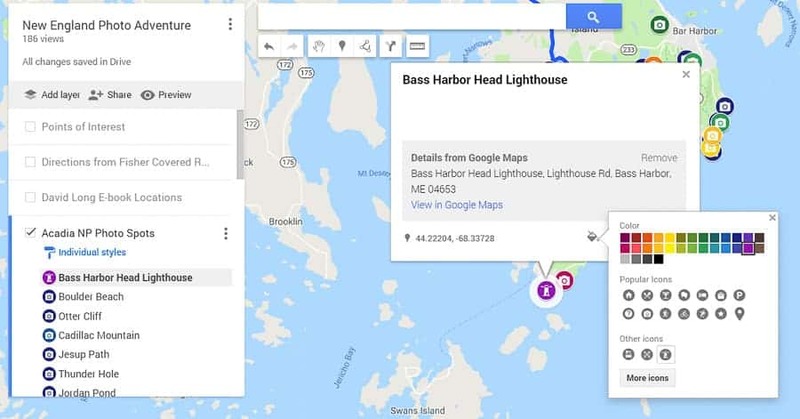 You’ll definitely want to shoot at the Bass Harbor Lighthouse!” Great, make a note, write it down and collect a list of place names in your trip preparation. If you’re planning to go to a well-known photo spot, chances are good people have written books about it. We picked up a recommended book, “Photographing Acadia National Park,” by Colleen Minuk-Sperry. It’s full of great information about photo spots in the park. Most popular photo locations will have similar books and they can be great resources as you make your list of places to go. I'm doubtful I will ever get to Mongolia to shoot, but if I do I just gotta go see this, the largest equestrian statue in the world at 131 feet! It’s doubtful there are many places that don’t have a website which discusses them. So, your company is sending you on a trip to Mongolia and you have some extra time for photography? Google “Top Photo Spots in Mongolia” and you will find companies giving photo tours. 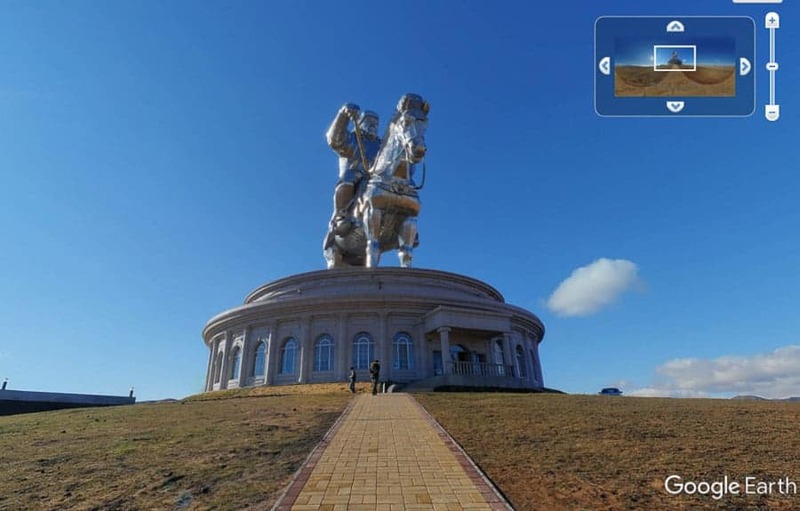 Browse a site and you might see a photo of the Chinggis Khan Equestrian Statue, the tallest equestrian statue in the world. Surely you’ll want a shot of that, yes? So, search it out in Google Earth and get the GPS coordinates – (47°48'29.40″N, 107°31'47.08″E). Now you know right where it is. My point is, there are likely no places left undiscussed on the web and with Google Earth, you can find them and their GPS coordinates. 500px is a great place to see what other photographers are shooting in almost any location you can think of. There are a huge number of online sites where photographers post their photos. It’s easy to prowl those sites and search for photos taken in the area you plan to visit. See something you like? Make a note of the name and then search for it. 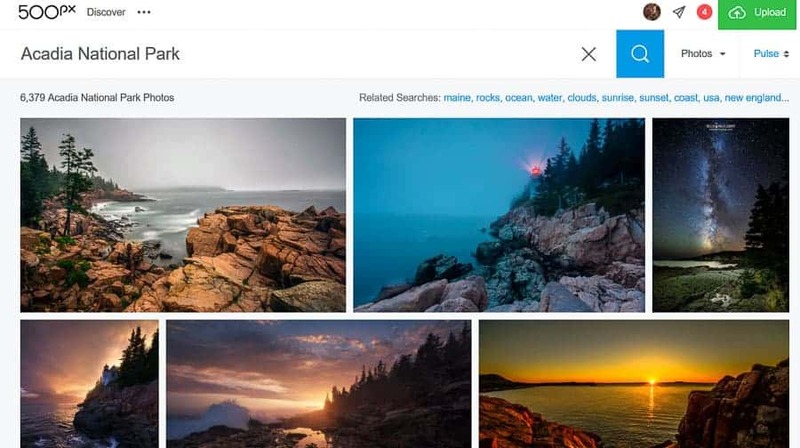 A popular spot to look for photos is 500px. Has anyone there taken a shot of that Chinggis Khan Statue? Heck, there were 27 of them when I looked! Very cool too! For our Acadia National Park trip? 6,379 photos on 500px the night I checked. Obviously, 500px is a great site to see where other photographers have been shooting in any given location. Places visited by other photographers are good places to check. Maybe there’s a local camera club. Where have they been taking photos? Who are some of the local photographers and what locations do they show on their websites and in their galleries? 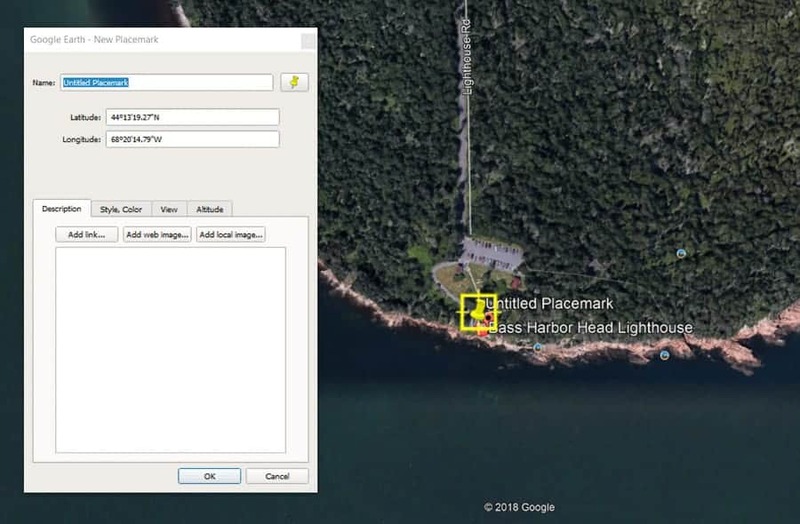 With a place name, it’s usually easy to hunt down the spot with Google Earth or Google Maps. Another location where lots of photographers post images is Flickr. Some will have the GPS coordinates listed if the EXIF data is posted though I’ve found the way it’s represented to require massaging to be compatible with other mapping programs. I find it easier to get an idea where the location is with Flickr and then pinpoint and get the GPS coordinates with Google Earth. 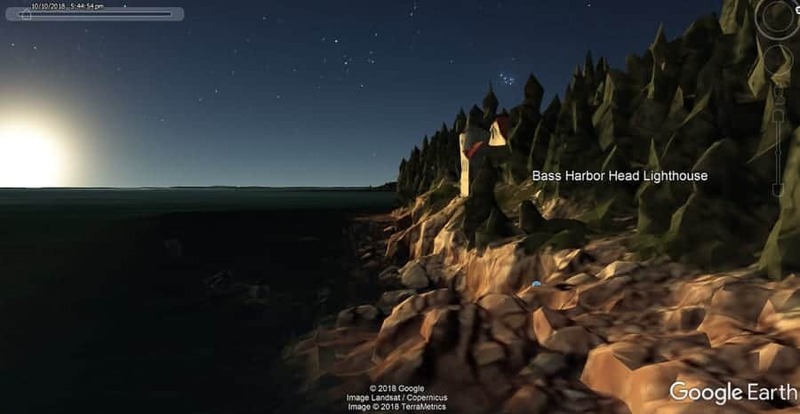 A “virtual flyover” of the Bass Harbor Lighthouse using Google Earth. One of the cool things you can do with Google Earth is “fly” to a general location and then look it over, zooming into places, viewing them from different angles, looking for place names and photos that others have taken, and getting a look at a place you’ve never been before. It’s a great way to “scout” a spot before going. Then when so when you are really there with limited time, your “virtual visit” will have given you some familiarity with the spot. Emulate the sun and light effects for any given date and time at any location. This is looking west at the Bass Harbor Lighthouse. I can see that for this date the sunset is just before 5:45 p.m. local time. Let’s go back to the Bass Harbor Lighthouse. Would it be better to shoot it from the east side looking west or the west side looking east? If I shoot it looking west to get the sunset, what time do I need to be there and where will the light fall at that time? All that can be emulated with Google Earth. Activate the sunlight slider, put in the time and date desired and move the slider to see how the light will move across the landscape. Very cool and very useful. Why be satisfied with the shot a million other tourists taken from Vista Point of the Golden Gate Bridge? The Bear Went Over the Mountain & You Should Too! You know the kids' song and why “The Bear Went Over the Mountain” right? To see what he could see! If you go to the same location and same spot other photographers go, won’t you pretty much get the same shot? How about if you went to a slightly different place and shot from a slightly different angle? You might see what the bear saw – The Other Side of the Mountain! That’s another great application for Google Earth. “Fly” over the landscape looking for an interesting spot, landforms, angles. Zoom into them. It’s like having a virtual drone to scout your locations. Spot a place that looks interesting, drop a pin to mark the spot and get the GPS coordinates. You then be able to add the spot to your plot map. 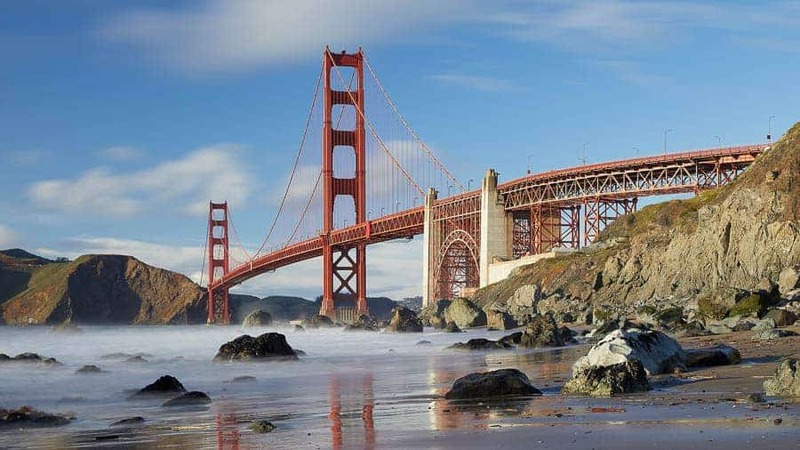 For example, you could shoot the Golden Gate Bridge in San Francisco from the typical tourist vantage point. 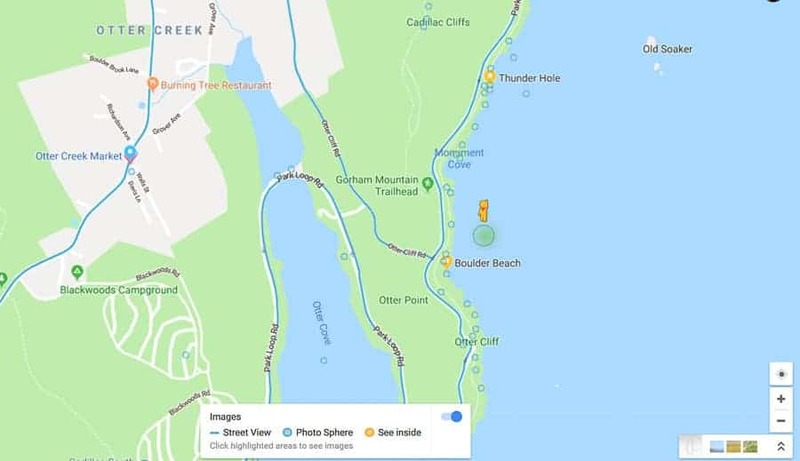 Or, you could use Google Earth to find that if you went to Marshalls Beach and shot from the south-west side you’d get a much more interesting shot. 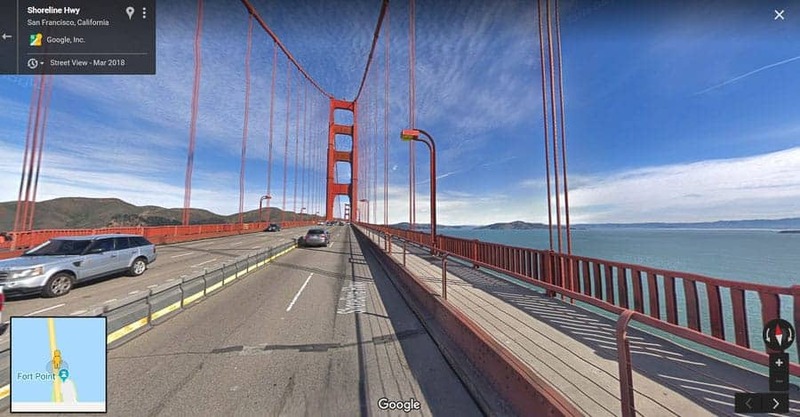 Do a little “virtual flying” with Google Earth and you can find this vantage point of the Golden Gate Bridge from Marshall's Beach. Using the Imagery feature in Google Maps you will see a collection of photos taken in the area your looking at. Click one and it will show on the map where it was taken. 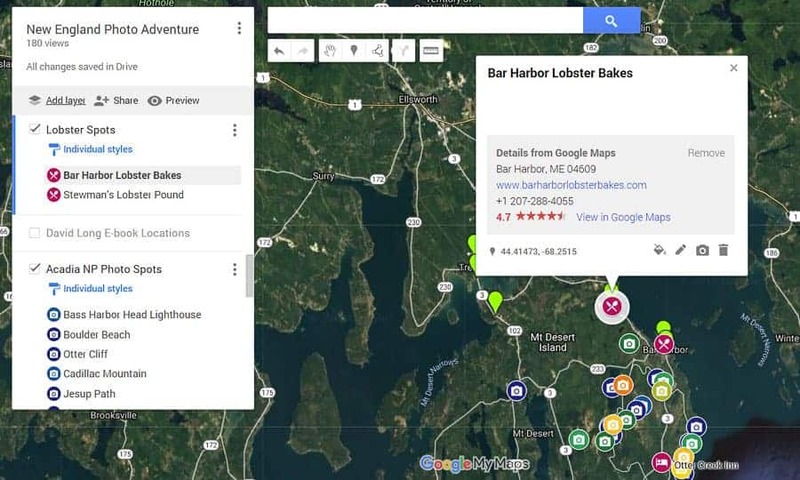 There are still other scouting tools you can use in Google Maps. Go to a location where you want to look around and don’t zoom in too far. At the bottom right corner of the screen, you will see three colored squares. Hover them and it will say “Show Imagery.” Click those and a row of photos will pop up across the bottom. Now as you move around the map the images will change showing different shots made in the area. Hover one and a line will show exactly where the photo was taken. Click it and you will see the photo large. Many of the photos may also be 360-degree panoramas and when they are full screen you can actively “look around.” It’s like virtually “being there!” You will know those as they will have a circular arrow icon on them. Pick up the “little man” in Google Maps and you can drop him on a road if it's highlighted in blue or an a 360-degree “photo sphere” for a virtual look around. 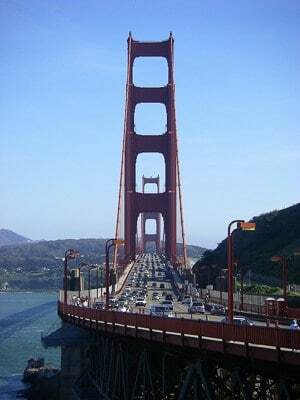 If I drop the little man on the Golden Gate Bridge for example, I can take a “virtual drive” across it. Also at the bottom of the screen will be a little “man.” Hover him and it will say “Browse Street View Images.” Left-click, Hold and Drag him over a road and if the road turns blue, you can drop him at that spot and go down to street view level. You can now “drive” that road as if you were actually driving and see the view. By virtually “driving” the road you are able to get a great idea of what you will see as you travel before you ever go there. Click the man to turn on all the locations you can zoom into and you may also see blue “photo spheres” where you can then click and get an interactive panning look at that spot. That’s just a fraction of the Youtube tutorials on how to use My Maps. I’d encourage you to spend some time looking at these and perhaps find some others (Search Google for –> My Maps Youtube ) to become familiar with the mechanics of the program, then go play. You will learn best by trying things. Before taking on a real project, perhaps make a simple map of your house location and some spots around your town. It will help familiarize you with how the program works. One way to look for spots to place markers in Google My Maps is to type a location in the Search Box. You may find it useful to change the Base Map (See the pulldown at the far left) to the Satellite When picking spots for photos, this view is very useful. If you have the GPS Coordinates you can enter those in the search box of My Maps and it will take you to the spot where you can add a marker. Rename it if you like and change the icon. Enter the GPS coordinates if you have those. – i.e. Marshalls Beach is at 37°48'6.69″N, 122°28'47.69″W. (I found that while flying the spot in Google Earth. In Earth, find the spot where you want the pin, click the Placemark Tool, then drag the pin there. A box will appear with the Longitude and Latitude, (See the image below). Copy and Paste those into the Search box in My Maps and complete the search. The Point will be placed there.) 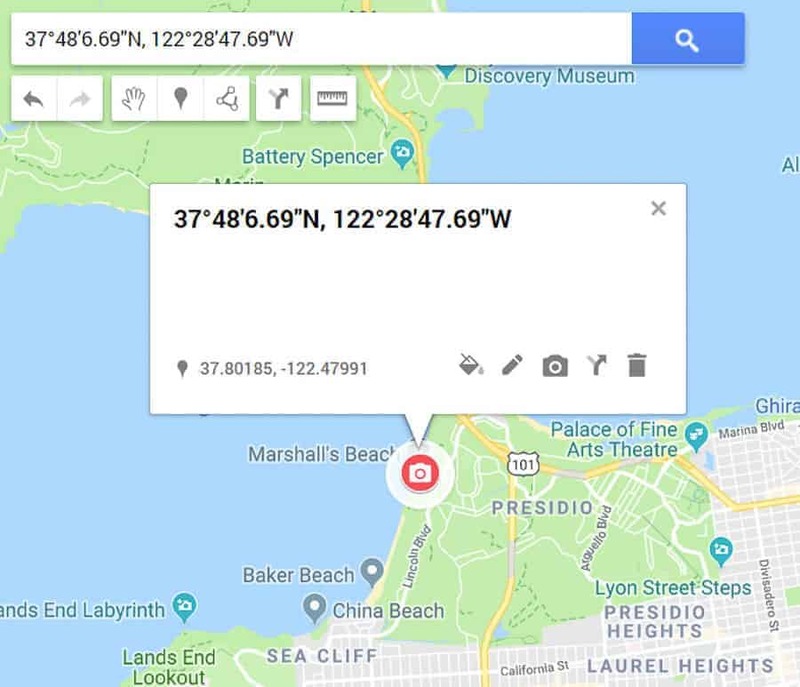 If you already have the coordinates from another source, perhaps from a website, printed document, or a photo with GPS coordinates embedded, enter those coordinates in the Search box. Sometimes the easiest way to add a marker to a location in My Maps is to simply pan and zoom there and add it to the spot with the Add Marker tool. This is the easiest method if you already have a good idea where the spot is. You can change the color and icon style of your markers if you like. In this case, I made the marker for the Bass Harbor Lighthouse purple and, used an icon of a lighthouse. Color coding and using custom icons will help personalize your map. Labels – Rather than have the Marker label be “Point 1” or the GPS coordinates if you use those, or whatever, use the Edit Tool (looks like a pencil), to change the name to something meaningful to you. Remember, the box below the title can be used for all kinds of notes, descriptions, weblinks, whatever! Style – Click the bucket and give your marker a designated color and icon if you like. Maybe locations for morning shots could be yellow and those for evening shots red, whatever you like. Photo locations could have a camera icon and eating spots a knife and fork – use the customization tools to make the map work best for you! Place your Markers with precision – The closer your marker is to the exact spot where you want to make your shot, the more useful it will be. To move a marker, zoom in close, click it, click the edit (pencil) tool, and then it will be free to move. Move it to where you want and then click again to place it. Gotta search out some lobster while in New England! I can create a separate layer in My Maps for whatever I want, in this case, Lobster Spots near where we'll be. I can then show or hide the layer so as not to clutter my other views if I don't need to see it. Layers are ways to Group and Show or Hide Markers. You might want to create a layer for each day of your trip, maybe one for different cities or general locations, maybe one for eating spots, whatever groups you find useful. Then rather than have an extremely cluttered map, you can show or hide just what you want. I can add a driving layer , input multiple points, and have the program plot a route. If I don't like what it suggests, I can adjust the route as a like. I was a little confused about this when I first did it. Think of it as you might when drawing a highlighter line on a paper map. 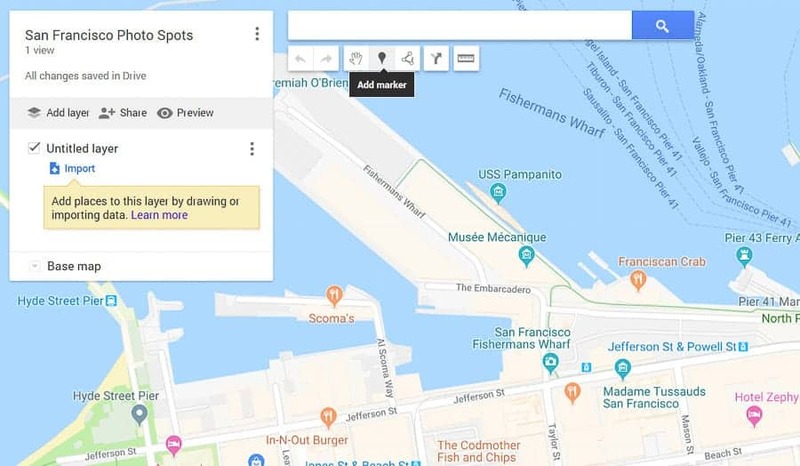 You will not be able to use this feature specifically for voice-guided point-to-point navigation later, (and we’ll discuss that in Part Two of this series), but instead as a way to plot a route on your map. It will go on a separate layer (which you can also name) and can route you between multiple spots. You can add a maximum of 10 points to each layer in a transportation mode. I'm not restricted to roads and driving in Google My Maps. 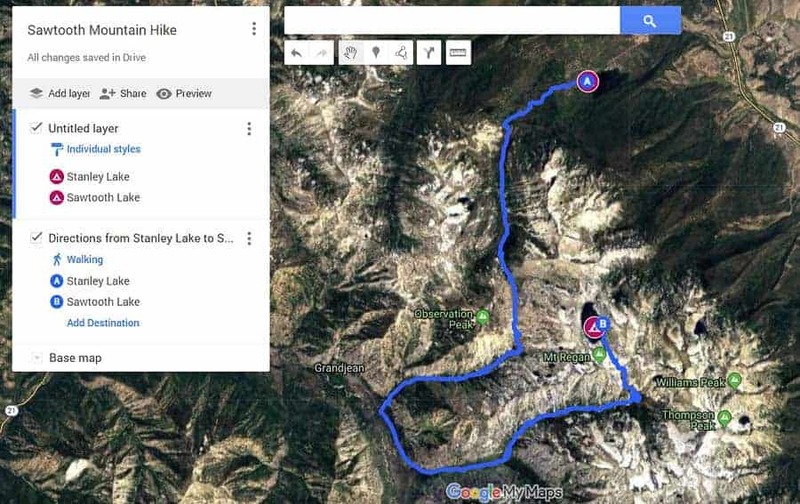 Use the Walking transportation mode, plot your points and My Maps will suggest a route on trails such as this one in the high country of the Sawtooth Mountains of Idaho between Stanley Lake and Sawtooth Lake. You can designate the means by which you will be traveling when charting a layer with directions. Using the driving mode will, of course, use driveable roads. If you will be traveling on hiking trails, My Maps can plot routes on those too! Keep in mind however, a layer cannot have a combination of modes so if you will be driving from one location to another and then getting on a trail and hiking from there, put the driving portion on one layer and the hiking portion on another. There is also a biking mode which will not chart a route on non-biking roads like interstate highways. You can also attach a photo to a marker, perhaps a good way to remind you of what you’ll see when you get to that spot. Click on a marker, click the little camera icon and you will be given an option on where to find the image to attach. 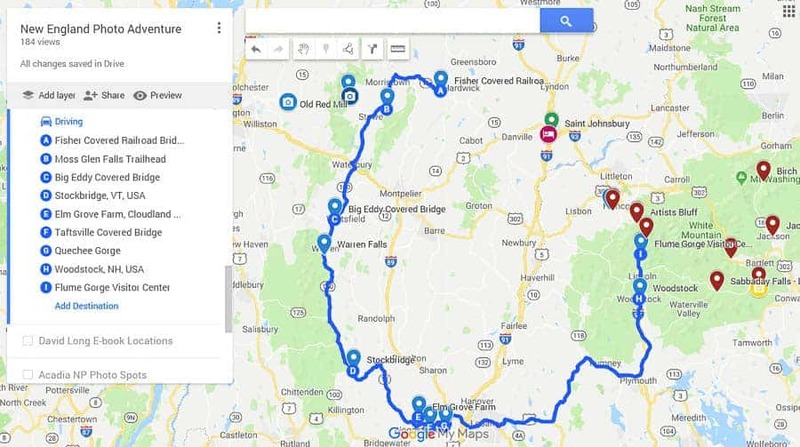 So you’ve spent some time and made a nice custom map which will show your photo locations, maybe attached notes about those, show routes to get to your places, have photos attached to the markers, all kinds of information about your trip. First, where is it and do you need to save it? No, fortunately as you work, your map is being saved as you go on your Google Drive. (Again, that similar naming thing… Don’t confuse Google Drive as a driving program. It is a cloud storage spot where your Google created things are stored online. Find it here – https://drive.google.com/drive/my-drive What you see here will be specific to you so it is safely stored and secure. What is also nice is any other device you have where you can access your Google account will have the map available. So, create it on your computer and it will also be available on your mobile devices or from any other device that can access the web. How else can you use your custom My Map? There are lots of ways to share your finished map. In addition to deciding who can see it, you can also decide if they have just View or Edit privileges. This can be a great way to collaborate with others planning a trip and creating a map. Go to the My Maps site on your computer, likely how you created it. You can view and edit it when you are logged into your Google Account. You will see a Share menu item in the column at the right of the Editing screen. Click it and you will have some options. 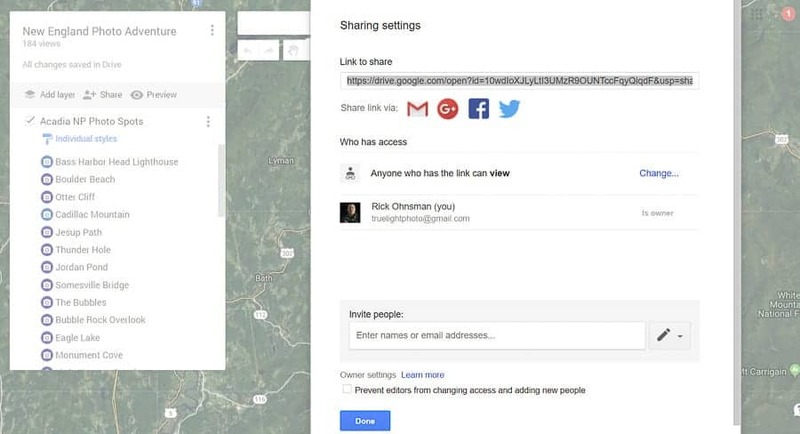 You will have a link you can share with others so they can see the map. You can also change whether those you’ve shared it with can only view it orcan also edit it. Shared edit access if a great feature when you have several people collaborating on a map. You can even make the map public on the web for anyone to see. Or, you can restrict access only to invited people. You can also share the link on various Social Media sites if you like: Gmail, Google+, Facebook. Or Twitter. Check out the various options on this menu to tune the way people can view and interact with the map. Take a look how the map will appear via the Preview menu Item (The one with the Eye icon). If the Legend at the left of the map is not showing, click Map Legend to expand that menu. In the Preview view click the three dot item at the top right of the Legend. One of the menu choices will be Print Map. Whatever layers are displaying at the time and however you have it zoomed is how it will print. You can print it to a PDF file or, if you select Image, print it directly to your printer. You can export the map as a KML or KMZ file. This file type is used by other mapping programs. For example, export it as a .KMZ file and it will be very usable in Google Earth where you will see your map with the Markers, routes, and then have all the “flyover” power of that program. Click the triple-dot menu item and use the Export to KMZ/KML option. You can then import that file into Google Earth. The next step will be to actually use your created Map to navigate from place to place while on your trip. I’m already running a little long with this article, so I will be getting into the specifics of how to do that in Part Two, which will appear here on the Improve Photography site on October 1st. I will update this article with a link making it easy to move between the articles. Until then, I suggest you use the techniques I’ve discussed to create a My Map. Learn as much as you can because in Part Two we’ll Take to the Highway!